Concerned about the growing influence of radical religious evangelists, Mr. Lear decided to leave television in 1980 and formed People for the American Way, a non-profit organization designed to speak out for Bill of Rights guarantees and to monitor violations of constitutional freedoms. People for the American Way remains an influential and effective voice for freedom. Mr. Lear’s business career continued in 1982, when Tandem Productions and his other company, T.A.T. Communications, were folded into Embassy Communications, which was sold in 1985. He then created and is currently chairman of Act III Communications, a multimedia holding company with interests in television, motion pictures, and licensing. 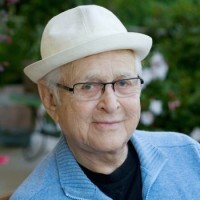 In addition to People for the American Way, Mr. Lear has founded other nonprofit organizations, including the Business Enterprise Trust (1989- 2000), which spotlighted exemplary social innovations in American business; the Norman Lear Center at the USC Annenberg School for Communication (2000-present), a multidisciplinary research and public policy center dedicated to exploring the convergence of entertainment, commerce and society; and with his wife, Lyn, co-founded the Environmental Media Association (1989-present), to mobilize the entertainment industry to become more environmentally responsible. In 1999, President Clinton bestowed the National Medal of Arts on Mr. Lear, noting that “Norman Lear has held up a mirror to American society and changed the way we look at it.” He also has the distinction of being among the first seven television pioneers inducted in 1984 into the Television Academy Hall of Fame. to all 50 states. As part of this Declaration of Independence Road Trip, Mr. Lear launched Declare Yourself, a nonpartisan youth voter initiative that registered well over four million new young voters in the 2004, 2006, and 2008 elections. Mr. Lear is married to Lyn Davis Lear and resides in Los Angeles, California. He has six children: Ellen, Kate, Maggie, Benjamin, Brianna, and Madeline, and four grandchildren: Daniel, Noah, Griffin, and Zoe. Mr. Lear’s memoir, Even This I Get To Experience, was published in October 2014 by The Penguin Press. “Norman is a titan in American culture. And as a World War II veteran himself, he has been a life-long supporter of veterans issues and a passionate supporter of IAVA since our founding. For the last decade, Norman has played a pivotal role in expanding Hollywood’s support for veterans. There is no finer example of the Greatest Generation and the potential of veterans than Norman. We are humbled to have him now helping lead IAVA’s bright future as a board member,” said IAVA Founder and CEO Paul Rieckhoff.